If, having paid for inferior programs from one of Mistral's imitators or plagiarists that have come and gone over the years you now wish your business to benefit from the same superior programs that your successful competitors are using, then look no further! Sorry but no, Mistral does not 'do Demos'. Mistral programs are guaranteed to perform exactly as described and our 30+ year long track record for integrity and reliability speaks for us. For serious enquirers a 30 day fully operational Trial issue is available for a modest charge and which is refundable upon conversion to order. 1) ANNUAL SUBSCRIPTION LICENCE’. Providing access on an annual basis for ALL programs listed below for a single user. Licence £125 (152 Euros US$176) per annum. 2) ‘CORPORATE LICENCE’. Providing access on an annual basis for ALL programs listed below. Unrestricted users in any one business or organisation. Fee based on size of organisation. Licence (from*) £395 (485 Euros US$556) per annum. * Based upon organisation total staff headcount. 30 day fully operational Trial issue £50 (60 Euros US$70) refundable upon conversion to order. 3) 'AIRWIND’ Mistral believe this is the only program ever written that will deal with any room shape, for a single room or space, with any type and mix of construction, in any world location and for any design conditions. All meteorological, geographical, Solar Azimuth & Declination, construction/fenestration material and key load data built-in. Provides hourly, daily, monthly and annual A/C load profiles with comprehensive, plain English, presentation quality printed reports. Naturally, 'AIRWIND Pro' is keyboard 'error and paradox trapped' to Mistral's exceptional standards and all printing and filing routines, database tools and help pages operate to standard MS Windows practices. Includes ‘SPLITWIND’, an automatic and illustrated A/C equipment selection program featuring A/C ranges from sponsoring companies such as Fujitsu, LG, Samsung and Panasonic. SI/Imperial switchable. Extremely powerful yet so easy to use. 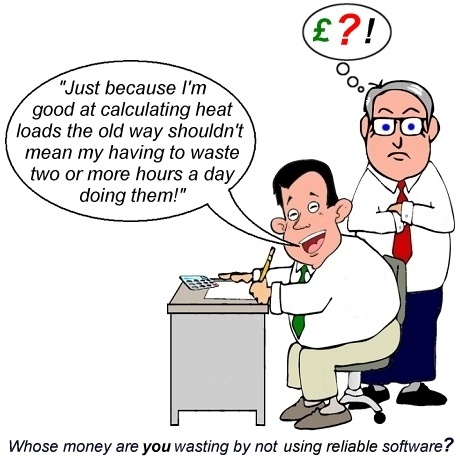 The basic A/C and heating load calculation program, suitable for the majority of smaller contractors. Easily upgradeable to the multi-room 'AIRWIND Pro’ version at a later date if required, simply by paying the difference in price. (Includes programs 7, 8, 9, 10, 11 & 12 below). 4) 'AIRWIND Pro’ Mistral believe this is the only program ever written that will deal with any room shape, for any number of rooms with any type and mix of construction, in any world location and for any design conditions. All meteorological, geographical, Solar Azimuth & Declination, construction/fenestration material and key load data built-in. Provides hourly, daily, monthly and annual A/C load profiles with comprehensive, plain English, presentation quality printed reports. Naturally, 'AIRWIND Pro' is keyboard 'error and paradox trapped' to Mistral's exceptional standards and all printing and filing routines, database tools and help pages operate to standard MS Windows practices. Includes ‘SPLITWIND’, an automatic and illustrated A/C equipment selection program featuring A/C ranges from sponsoring companies such as Fujitsu, LG, Samsung and Panasonic. SI/Imperial switchable. Extremely powerful yet so easy to use. (Includes programs 7, 8, 9, 10, 11 & 12 below). 5) 'COLDWIND’. The established standard for the Refrigeration Industry. Used by leading refrigeration companies throughout the world to prepare coldroom refrigeration load calculations and reports. Faster than so called 'quick selection charts' and infinitely more accurate. Compute refrigeration loads, in either Imperial or SI units, for projects drawn directly on-screen, with any number of walls for a single refrigerated space, arranged at any angles, with any mix of insulation materials, located anywhere in the world! Automatic & correctly weighted energy profiling at 30 minute intervals for every day of the year. Large product database and many new features including:- pitched roof option; in-situ sprayed foam polyurethane insulation; refrigerated containers, trucks and vans; blast freezers and blast chillers; 'context sensitive' help pages; 'cue' cards; bar graphs and pie charts; conventional 'Windows system' calculation filing, file retrieval and colour printing routines; superb quality report summaries and much, much more. (Includes programs 7, 8, 9, 10, 11 & 12 below). 6) 'COLDWIND Pro’. The established standard for the Refrigeration Industry. Used by leading refrigeration companies throughout the world to prepare coldroom refrigeration load calculations and reports. Faster than so called 'quick selection charts' and infinitely more accurate. Compute refrigeration loads, in either Imperial or SI units, for projects drawn directly on-screen, with any number of walls, in any number of rooms, arranged at any angles, with any mix of insulation materials, organised into any number of zones and located anywhere in the world! Automatic & correctly weighted energy profiling at 30 minute intervals for every day of the year. Large product database and many new features including:- pitched roof option; in-situ sprayed foam polyurethane insulation; refrigerated containers, trucks and vans; blast freezers and blast chillers; 'context sensitive' help pages; 'cue' cards; bar graphs and pie charts; conventional 'Windows system' calculation filing, file retrieval and colour printing routines; superb quality report summaries and much, much more. (Includes programs 7, 8, 9, 10, 11 & 12 below). 7) 'COOLWIND', 8) 'CONDWIND', 9) 'COMPWIND', 10) 'PACKWIND', 11) 'Valvewind' and 12) 'SPLITWIND' Unit cooler, Condenser, Condensing Unit, Compressor, Packaged Refrigeration, Refrigerant Expansion Valve and Split A/C selections from leading manufacturers such as Copeland, Danfoss, Dorin, Kelvion Searle, Kobol, Küba Kältetechnik, L'Unite Hermetique, Lu-Ve Contardo, Maneurop, Marstair, Roller, Samsung, Sporlan, Trenton, Zanotti and etc. Struggling with elusive correction factors and selections methods that vary from one manufacturer to another is a problem of the past. Selects from tens of 1,000's of listed products, shows all viable alternatives complete with precise corrected duties - all in less than 10 seconds ! Select against 'CELLWIND', 'COLDWIND' and 'AIRWIND calculations (as appropriate) or may be run independently. Graphically displays Balance Points when all modules are installed. Also prints out electrical data and dimensions and displays photographs and wiring diagrams etc. on screen from manufacturers' own product literature. Importantly, these programs also calculate sound pressure levels for single or multiple units, (when manufacturers have supplied the necessary data) at the set site boundary distance. 13) 'CELLWIND Pro’ Produce accurate and thus competitive beer cellar refrigeration load calculations to brewery specifications. Copes with any shape room plan, various building constructions (including mixed materials), cellars above ground and below (or anywhere in between for that matter), solar gains, product loads and pull down times, running loads, cooler fan loads etc., etc. All built into the program and easy to enter. Neatly laid out, comprehensive printed summary for your records and tenders. (Includes programs 7, 8, 9, 10, 11 & 12 above). 14) 'COSTWIND' Design a coldroom on screen with interactive graphics, select insulation types, surface finishes, accessories such as lighting, dunnage battens, meat rails, door ramps, shelving etc.. Choose the preferred manufacturer, elect for delivery only or supply and erection, enter profit margins and then print out a finished quotation, a comprehensive Bill of Materials and a Standard Labour cost schedule. Automatically communicates with 'COLDWIND Pro’ (Coldroom refrigeration load calculation program) to save re-entering or duplicating data. Create your own database of component costs and labour times/costs. 15) 'LINEWIND’ Similar to ‘PIPEWIND’ as described below but this is the ‘junior’ version and therefore only deals with a single refrigeration load at a time. Nonetheless a very powerful program, ideal and exceptionally good value for smaller contractors or those generally installing simpler refrigeration systems. (Includes programs 7, 8, 9, 10, 11 & 12 above). 16) 'PIPEWIND Pro’ The not-so-simple task of sizing refrigerant pipework for complicated multi-cooler, multi-circuit ring mains made into child's play. Icon and menu driven with 'ideogram' graphics. Totally error trapped program pays for itself every time it is used - and carries on doing so, time after time after time. Automatically loads without fuss or bother the pressure enthalpy/entropy, viscosity, performance data for many of the new refrigerants, plus the old ones for reference purposes. Steel and copper pipe data plus length equivalence factors for bends, tees and valves etc. all automatically entered so the bare minimum of key information (system duty, temperatures and required lengths) is all that is needed to quickly and accurately display/print correct pipe diameters, pressures, pressure drops and mass flow. Facility to add new refrigerant and alternative pipe information to the program's databases. (Includes programs 7, 8, 9, 10, 11 & 12 above). All programs are supplied with dynamically linked, interactive, colour illustrated 'Help' pages and manuals. Programs may be supplied with essential regionally specific variations. All computer programs are supplied as Internet download and are suitable for operation on both Linux and also IBM PC or compatible computers using MS Windows 7, Windows 8 or Windows 10 operating systems (except Windows 10S without upgrade). Prices quoted are for User’s Licences only. No title for code, data or images contained within programs passes to licensees. All major programs operate simultaneously in both English and French languages. Daily Exchange Rate fluctuations may mean the price you pay through Mistral's Secure Server is slightly different to prices shown above. Large adverse differences (above single figures) will be quickly refunded upon request. Would you offer to do the same for us if the difference is in your favour?! Prices valid to 31 December 2019. Late Payment of annually renewable licence fees. Our policy.